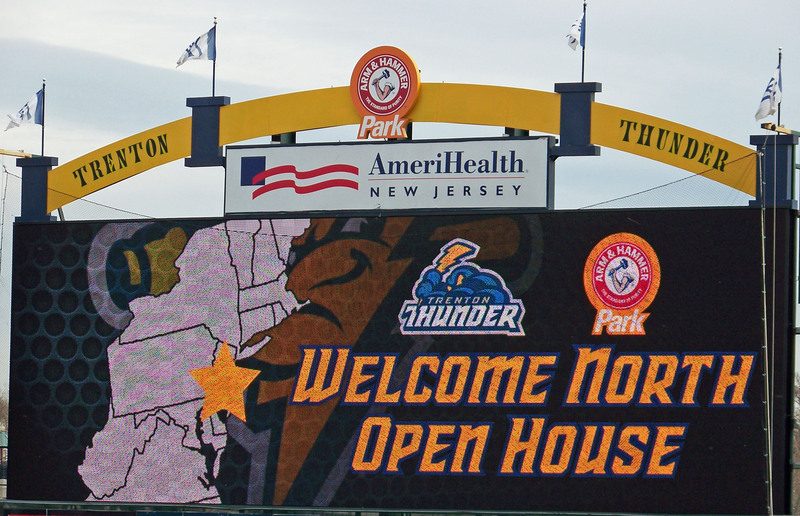 The Trenton Thunder held their annual Welcome North Open House event yesterday, giving fans the opportunity to watch batting practice and then meet and get autographs from the members of this year’s team. Four of the New York Yankees’ Top 30 prospects (as ranked by Baseball America) will start the year in Trenton. Catcher Gary Sanchez is regarded as the organization’s best prospect and is on the 40-man roster. Outfielder Mason Williams is ranked number three in the Yankees’ system. Pitcher Bryan Mitchell, also on the 40-man roster, is ranked #21 and is scheduled to start on Opening Night tomorrow. Infielder Rob Refsnyder is ranked #29. This is the first time that I got to go, but a couple of friends who have attended in previous years said that the crowd is usually bigger. That turned out to be a good thing, allowing me to get nearly everything I’d brought with me signed even though the players were broken up into groups of three or four at different spots on the field. In very excited to see what Refsnyder can do. I like him a lot.